Kontrol Limited was founded in Jersey in the Channel Island 40 years ago. 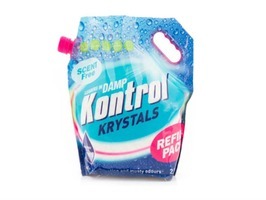 Kontrol are a small but specialized niche business operating from Shropshire who specialize in Home and Garden solutions over the categories of Humidity Control, Cleaning, Laundry, Clothes Protection, Home Fragrancing and Pest Control. They are a small but dedicated team and endeavor to keep bringing you quality and value products providing everyday solutions for homes and gardens. To the best of our ability we will continue to do this in a socially and environmentally responsible way and at all times in a friendly and efficient manner. 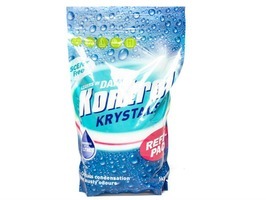 Kontrol have created the UK’s leading Moisture Control Range with products such as the Kontrol Streamline Moisture Collector and Kontrol Krystals refill packs in resealable bags and supplied in both 500g and 2.5kg sizes. 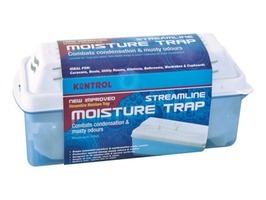 These products are stocked by Homestead Caravans as they offer a very effective solution of Dehumidifying caravans, motorhomes and boats to keep unwanted moisture and condensation under control and give protection against damp musty odours and mildew. 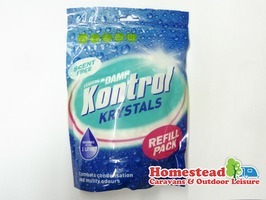 This is particularly ideal for use when the caravan or motorhome and boat are not in use and during winter storage. They are equally as efficient and useful around the home. Our activity within our home generates water vapour – cooking, showering, gas fires, boiling kettles and even breathing! Based on an average family of 5 – introduces 10 litres of water per day! Even more during the winter months when the windows are closed and ventilation is poor.